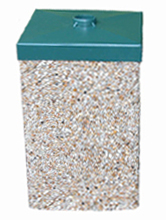 Sentry Collection - Best Litter Receptacles Inc.
Sentry Collection, "It's Always There"
These receptacles are manufactured of solid, reinforced concrete in one piece construction from steel molds to insure consistency and quality of the product. 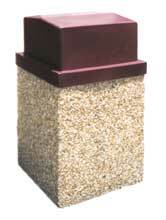 Finished exterior is exposed aggregate which is sealed with acrylic sealants. 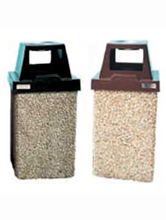 They are available in two colors; River-rock brown or Granite gray and choice of color-coordinated lids are included, as are the 10, 30, or 40 gallon liners. These receptacles are completely assembled, wrapped in plastic and shipped on individual pallets ready for use upon delivery. 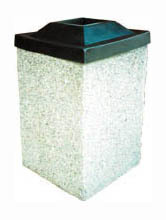 Lids - are manufactured of heavy-duty rotary molded polyethylene, which is U-V stabilized with permanent pigmentation. They are secured to the inside of the concrete unit by a steel chain. The four styles of lids are the low, drop-in center style; the raised, or hooded, style with one or two openings on the sides; with ashtray in the lid; or with doors. 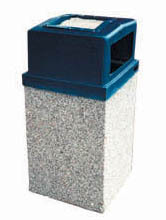 Liners - are also manufactured of heavy-duty rotary molded polyethylene and are square in shape to fit the contour of the receptacles. 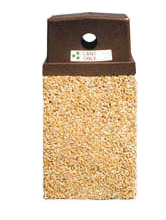 This is to prevent trash from falling outside the liner and remaining in the concrete. Raised lid with covered top - one or two openings. 20" x 20" X 40"
410 lbs. - 30 gallon cap. 24" x 24" X 43"
520 lbs. - 40 gallon cap. Low-lid, slightly sloped to prevent sitting on them and provides adequate drainage. 20" x 20" X 34"
24" x 24" X 38"
top of lid with drain holes. 370 lbs. - 30 gallon cap. 14" x 14" x 31"
collection of cans, plastic, and glass.